At least one survey reveals that the average Millennial thinks (s)he is a great hiring prospect. According to another, the average HR professional seems to sharply disagree. How is it possible for HR assessments to widely and wildly diverge from Millennial self-assessments and how big is the assessment gap? According to a recent report about a Beyond.com survey, it’s very big: “While 83 percent of Millennials viewed themselves as being ‘loyal’ to an employer, only 1 percent of HR professionals associated their generation with that trait… Some other things Millennials need to work on in the eyes of HR professionals? Communication and team spirit. Such huge disparities between self-assessment and independent evaluation are more problematic than other kinds of disagreement. When two people disagree about a third thing, such as how good the Yankees are, the disagreement per se doesn’t reflect badly on the Yankees or other third things. But when an HR professional and candidate disagree about how good one of themselves is, namely, the job applicant, the latter faces a double-whammy a Yankee doesn’t: his or her reliability of judgment, as well as the job, is on the line. So, faced with these risks, Millennials may want to reflect on why their self-perception is far more likely to be reflected in a mirror than in the perceptions of the surveyed HR pros. Tackling this puzzle is actually more like taking a hard look at a puzzle piece in a much bigger puzzle: How is it possible for sensible, perceptive, well-informed and fair-minded people to disagree about anything? Some of the possible reasons are commonsense explanations, such as differences of taste or the use of excuses; others are more technical, e.g., “cognitive dissonance reduction”, “confirmation bias” and “slippery semantic slope”, e.g., the easy descriptive slide from “loyal” serf to “self-serving” serf—to be discussed in a separate analysis. 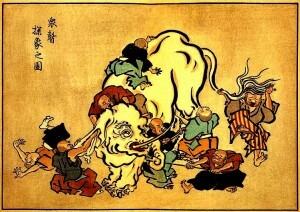 Other explanations are somewhere in between the obvious and the esoteric—like the two that follow, which draw upon well-known, simple, yet highly instructive scenarios: the parable of “The Blind Men and the Elephant” and the venerable conundrum about whether a tree that falls in the forest when no one is around makes a sound. 1. Partial data—the elephant in the room: Remember the parable of the blind man and the elephant? One blind man grasps an elephant’s tail or trunk and thinks it’s a snake or a rope, another pats a stout leg and thinks it’s the trunk of a tree or a pillar, etc. Each has a partial, incomplete impression that, although in itself well-founded, viz., “skinny as a snake”, “thick as a tree trunk”, is mistaken for proof. Similarly, a Millennial may cite his respect for contract confidentiality clauses and willingness to defend his employer’s reputation as proof of his loyalty, while an HR professional, based on his or her “evidence”, expects a Millennial to disloyally jump ship as soon as a better opportunity presents itself. Hence, the difference in perceptions of loyalty may be due to the incomplete and conflicting evidence the two parties cite (or expect). This incompleteness may take the form of the Millennial’s mistaking necessary, partial conditions for loyalty (e.g., respecting confidentiality and rallying to an employer’s defense) for complete, sufficient conditions (which would include not being all too ready to bail for a better job). On the HR side, the incompleteness and partiality may take the form of a too-small population sample of Millennials or preconceptions about them that seem compelling and tempting enough to over-generalize and over-extrapolate. If on the basis of a tiny sample of one or two Millennials, an HR manager generalizes about them, that generalization will only be as good as the sample of Millennials was random and to the degree it was uncontaminated by factors like any Millennial responses to an HR manager’s alleged mistreatment of them after they were hired or his need to rationalize those. While this elephant example actually illustrates disagreement based on extrapolation from incomplete and incompatible data, there are cases of disagreement based only on the incompleteness and incompatibility of information available to the job candidates and the managers or other recruiters and not on an extrapolation. One illustration of this should suffice: an incomplete resume. Both the HR decision-maker and job applicant agree that a resume has to be complete to be good and that failure to assure this is a disqualification. If the submitted resume is, unintentionally and unbeknownst to the applicant, incomplete, it is only natural that the HR pro’s opinion of it will be incompatible with that of the applicant, who thought his resume was perfect. Note that “incomplete” and “incompatible” are two independent data characteristics, even though they often correlate. The information anyone has may be as incomplete as that of another, with both sets of information being perfectly compatible, e.g., I remember the first three digits of our friend’s phone number; you remember the last four. Partial information is not necessarily incompatible with that of the other party. So, when one blind man grasps only the tail and the other pats only a leg, when asked in a survey, “Was it a serpent in a tree?”, they might agree it’s possible that it is a serpent in a tree. Likewise, HR staff and Millennials could theoretically agree about the latter’s loyalty, even if their evidence is partial and contrasting (without being incompatible). 2. 2. Conflicting definitions—the tree in the forest: Maybe the managers and Millennials seem to disagree because they or the surveys that tapped them adopted conflicting definitions or standards, e.g., of the degree of some behavior shown in order to count as loyalty. This means that sometimes the problem is not with the data, but with the criteria of what counts as data or with key definitions, especially when two different groups participate in two different surveys presumably about the “same” thing, e.g., loyalty, and end up with an unexpected disagreement—as the HR professionals and the Millennials reportedly do about the latter group’s loyalty and team spirit. One handy rule of thumb presented in critical thinking courses is, “When faced with a contradiction, make a distinction.” The so-called paradox of “the tree that falls in the forest when no one is around”—i.e., makes a sound and does not—is easily resolved by making a distinction between “sound” as physical vibration in the air (yes, there is a sound) and “sound” as perception of that vibration (no, there is no sound). When managers and the Millennials disagree about how loyal the latter are, maybe we and they should examine their personal or the survey definitions of “loyalty”, to be sure that the contradiction isn’t due to conflicting notions about the degree of loyalty required to pass the test or about what defines it. As suggested above, there are many other causes of disagreement (to be explored in a follow-up analysis), including the degree to which one of the participants is motivated to “salvage” the “data”, e.g., by making excuses or demanding evidence for the reliability of the counter-evidence against his or her own claims. …or of a fallen tree.